The secret to proper cuts on the stock in your woodworking projects is to use the right saw blade. Of course, the saw blade that you use should be sharp enough to cut cleanly through the stock without burning or tearing the wood. The two primary types of circular saw blades are the same as the two primary types of traditional hand saws: rip blades and crosscut blades. A rip blade is designed to cut with the grain of the stock. It has a limited number of very deep teeth, to help clear away the material that is cut. A rip blade will cut with the grain very quickly, but won't leave the cleanest of finishes. A crosscut blade cuts with kerf using chisels or carbides that alternate between cutting wide left and wide right every other tooth. This can produce a very fine finish on most materials when crosscutting. Combination blades are those that combine the benefits of both rip and crosscut blades and are quite common. Combination blades come in a variety of tooth counts, typically ranging from as low as 24-tooth to as high as 80-tooth. The rule to remember is the more teeth, the finer the finish. Blades with a low tooth count will cut very aggressively but leave a relatively rough finish, whereas a greater number of teeth will leave a cleaner finish. Specialty blades, such as plywood blades, will have a much higher tooth count and will leave a smooth finish with little tear-out but cut comparatively slowly. There are specialty blades for cutting other materials, such as diamond-tipped blades for cutting masonry, or hardened blades for cutting steel and aluminum. Specific to woodworking, another common type of specialty blade is the dado blade. The two types of dado blades are "wobble blades," where the blade is adjusted to a particular angle to create a dado, and stacked dado sets. Wobble dado blades can create a considerable amount of vibration, which can be a bit unnerving when in use. Additionally, wobble blades don't leave the cleanest dadoes for your joinery. A preferred, but more expensive type of dado blade is the stacked dado set. This set consists of a full crosscut blade on each side of the arbor, with smaller "chippers" in the middle. The chippers are typically either 1/8-inch or 1/16-inch in thickness. The width of the dado is dependent on the number of chippers on the arbor between the two blades. A typical stacked dado set will be able to cut dadoes between 1/4" (using no chippers) to 13/16" (using the entire complement of chippers). 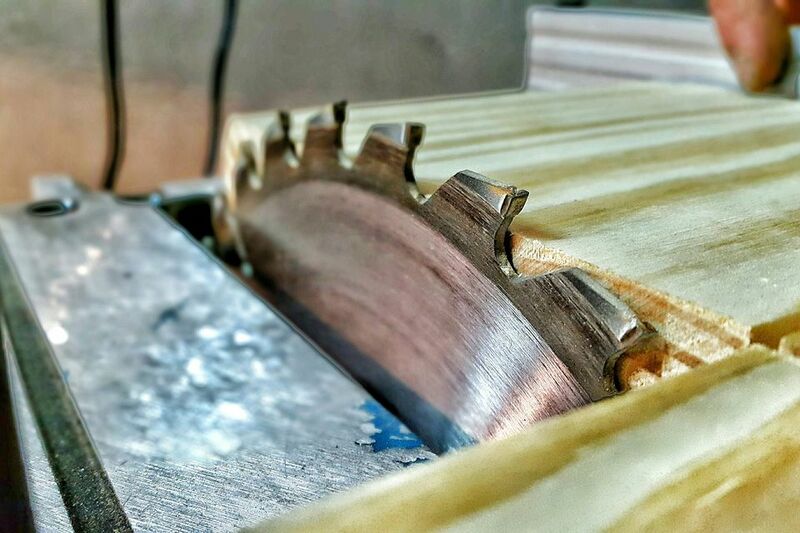 Dado blades should only be used on table saws or radial arm saws. They are not safe for use on a circular saw. Saw blades come in many different sizes, ranging anywhere from 5" to 12", but only certain sizes are available for use on each particular type of saw. Consult the documentation that comes with your saw(s) to determine what sizes of blades can be used on your particular models. Never attempt to use a blade that is not of the recommended size on any of your saws. Circular saw blades are typically 7-1/4" in diameter, whereas table saws, radial arm saws, and compound miter saws will most often use 10" or 12" blades. When you've used a saw blade for a period of time, they can become dull or caked with pitch and thus less effective. If a considerable amount of sap (pitch) has collected on the carbides, there are cleaning solutions available at your fine woodworking supplier to remove the pitch. You can also try this handy bit & blade cleaning tip. If you purchase quality carbide blades, they can be sharpened by a professional saw sharpener, which will increase the life of the blade. Some companies that make high-quality saw blades, such as Forrest offer sharpening services through the manufacturer's website (for a fee, of course). However, quality blades can be sharpened a number of times, which will help justify the increased initial cost. Better quality blades will cut quicker and cleaner, and keep their edge longer. Will a Stacked Dado Blade Fit on Your Table Saw? Can You Use an 8-Inch Dado Set on Your Table Saw?